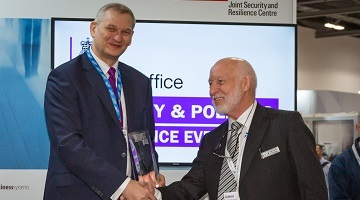 Exhibitors at Security & Policing are invited to enter the ADS Security Innovation Award which recognises the innovative capabilities and services developed by UK security companies. Congratulations to Safetyflex Barriers for winning the 2019 ADS Security Innovation Award. The company received the award for Springline 50, a new generation of anti-terrorist crash fencing that requires only 400mm foundations and stops an 18 tonne truck travelling at 50mph/80kph in accordance with PAS68 IWA14. Mercia Solutions was awarded the runners-up position for MediaStation, a networked system for downloading and transferring video, images and audio following forensic procedures that has been used evidentially by emergency services for disaster victim identification, saving hundreds of hours of police time through remote identification processing. Jepson & Co – for PlateSync®, a unique networked security tool for preventing number plate cloning. SeeQuestor – for SeeQuestor Model 5, enabling rapid on-site deployment and significant improved performance of the pioneering video analytics platform. Thank you to to all the companies who entered for the 2019 ADS Security Innovation Award. The annual ADS Security Innovation Award, recognises the innovative capabilities and services developed by UK security companies. The award is specifically designed to identify those capabilities that have caused a step change in the effectiveness of the UK’s ability to prevent, respond to, reduce the impact of or investigate risks. To the highest scoring organisation, to the second highest scoring organisation (runner-up) and, at the judging panel’s discretion, to highly commended entrants. Companies were notified of the results in February 2019.